Love Saves the World: Happy Release Day to Lauren Smith! I have to say thank you to Ki Pha, who posted about this book on Facebook. The cover is amazing and, when you read the blurb, it will definitely hook you! Lauren Smith is one of the debut authors I am watching out for this year -- and she debuts her book today! Happy Release Day to Lauren Smith and to her debut historical romance novel, Wicked Designs! 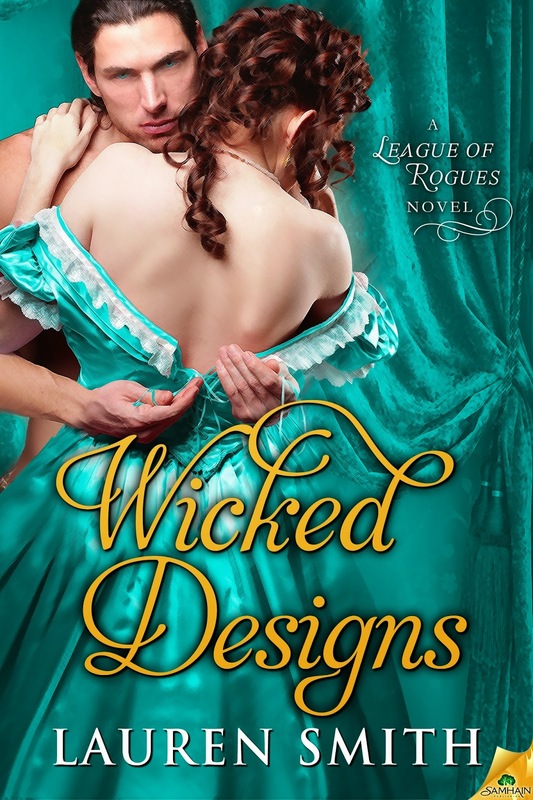 Tagline: The League of Rogues takes what they want -- but have they taken on too much? Blurb: For too long Miss Emily Parr has been subject to the whims of her indebted uncle and the lecherous advances of his repulsive business partner. Her plan to be done with dominating men forever is simple—find herself a kind husband who will leave her to her books. Lauren Smith is an attorney by day, author by night, who pens adventurous and edgy romance stories by the light of her smart phone flashlight app. She’s a native Oklahoman who lives with her three pets -- a feisty chinchilla, sophisticated cat and dapper little schnauzer. She's won multiple awards in several romance subgenres including being an Amazon.com Breakthrough Novel Award Quarter-Finalist and a Semi-Finalist for the Mary Wollstonecraft Shelley Award.